Marin General Hospital, the safety-net hospital for the Bay Area, is undergoing a $534 million recapitalization project to replace its 1950s-era buildings and bring its campus up to seismic standards for California. The new digs will include a 177-bed private room hospital with floor-to-ceiling windows in all of the patient rooms. The goal is to complete the project by early 2020. 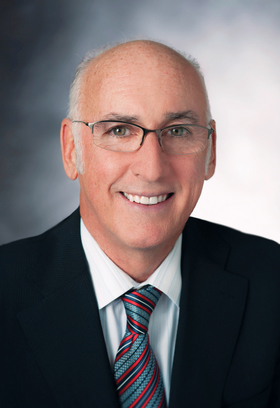 Marin General CEO Lee Domanico says that while other hospitals are consolidating, he felt confident that continuing as a free-standing hospital, with a mix of about 80% Medicaid patients, would be supported by the local community. And the community delivered. Most of the new project's capital was generated through a $394 million general obligation bond supported by property taxes. The remainder will be financed through debt or retained earnings. Modern Healthcare hospital operations reporter Alex Kacik recently spoke with Domanico about Marin's standing in the community and the rewards and challenges it faces. The following is an edited transcript. Modern Healthcare:​ What's your take on the idea that providers need scale to survive? Lee Domanico:​ I think that may be used as an overgeneralization. I do think there are some providers that can be helped by scale. Scale does help you access the debt markets and the capital markets. And it may give you some small advantage on buying power for drugs and supplies. It does give you, I think, an even playing field in negotiating with insurance carriers, but it depends. In our case, because of our geography, location and the full-service nature of the hospital, we're an essential hospital for most of the insurance carriers. So, that's a big factor when you look at if you're essential to Blue Cross/Blue Shield or not. You know if you want to serve subscribers in Marin County, you probably need to have Marin General as part of your network. So, I think the answer to that question is very situational and locational. But I will tell you that when you're in a large system that has broad geography, you compete with everybody. And when you're independent, all those other providers that were competitors, become potential collaborators. And so, we've used that to our advantage. We collaborate with UCSF. We collaborate with Stanford. We're in a large insurance product with 12 other hospitals to leverage into population health management. We've partnered with two academic centers on several clinical programs, and through the development of this sort of HMO product that's starting to come on the market. And as an independent hospital, we've partnered with about 150 physicians in a clinic operation and a medical foundation. We have joint ventures in the surgery center and imaging centers, all with our local physicians. And so, we've become very integrated locally. And we think that we can partner externally for the things that require scale, like an insurance product, for example. MH: Do you foresee owning an insurance product? Domanico: We're never going to start our own insurance company here. I don't think we have to. We're happy to be a player without having to be an owner of an insurance product. I also think that when you are free-standing, you need to be very partnership-minded and collaboration-minded. We have a $90 million partnership with Royal Philips Corp. It's a management-services partnership where they provide us with monitors and imaging-type technology over a 15-year period. It's another example of figuring out ways to finance things and acquire technology as an independent hospital where having spikes in the need for capital could be a challenge. Philips embeds employees on-site and helps with the servicing of the technology. It gives us early access to technology as things come to the market. That's very important for us because our largest, biggest competition, even though we also collaborate, are the large hospitals in the city. And so we need to be able to provide cutting-edge technology and leading-edge medical services because people can go across the bridge for elective care. And that's why we partnered with UCSF and Stanford—it increases the sophistication of the medical care we can provide here to give people an opportunity, if they want to, to stay in the community and get the same or better clinical outcomes. So I think it can be done financially and clinically as an independent hospital if you have the right externalities in place. MH:​ How do you approach partnerships with other health systems, knowing that you don't necessarily want to merge, but you probably need to align somehow in order to achieve the best outcomes and quality? Domanico: We look to see if there are others out there who have a strategic interest in Marin. And if they do, there are two ways to exercise that. They can come here and compete, or they can come here and partner. And so, we try to for those who would be advantageous to have a connection to Marin, and then we try to talk to them about doing it on a partnership basis with us as the dominant hospital in Marin. And so you come in and you work with the dominant hospital to further expand, grow, serve more people, expand the breadth of service offerings, things of that nature. We have garnered interest in others wanting to partner with us, without an interest in owning Marin General. Marin General is not going to be sold, because first of all, we don't need to. Secondly, we're really owned by the public. The public just put up $400 million for a new hospital. And so, if you want to do business in Marin, I think the way to do it, is to do it with us as opposed to compete. MH: What's your outlook for independent hospitals? Domanico:​ I suspect that there will continue to be consolidation. There will be some dis-integration, but I think that will be small, so there will still be more consolidation. Maybe the pace will slow down. I'm not familiar with, really outside of California, but Northern California is pretty much done. And those that are independent are pretty strong, and they'll probably stay that way. But there may be other places in the country where you still have independents that are not strong, and I think they might be more vulnerable and have more challenges to stay independent for the long term. Independent hospitals need to anticipate challenges and if they're going to seek a partner, seek one while they're strong, as opposed to when they're weak. MH: How have rising drug prices affected an independent hospital like Marin? Domanico:​ I would say in the last two years, that category is our fastest-growing expense. But the big number is in labor. Labor is local. And I have to say, I don't really believe that systems overall have resulted in lowering the labor cost at their hospitals. In California—in particular in an area like Marin County, because the real estate cost is so high for physicians—one of our biggest concerns is being able to afford the support to keep a vital medical community, because it's increasingly harder for, particularly primary care doctors, to make enough income on an independent-practice basis. And their choices will be to join Kaiser or leave the community. We've had to step in and support the physicians, which is important for the community and the hospital, so they have access to primary care and other specialists. But over time, that's a challenge-to be able to have the hospital do well enough to support the physician population essentially. That's one of my big concerns over time. I guess the other thing is, it's not an issue yet, our IT expense is running just over 4%, which is very competitive. Long term, it's an issue to make sure we can afford and access the technology solutions as they come on the market, but again, I think we try to do that; and if we don't do it ourselves, we do through a partnership relationship. MH: What are your concerns going forward in terms of staying independent? Domanico: One of the big concerns is the repeal of Obamacare and reduced federal funding for indigent care. Here the concern is the high cost of living. It's not going down, it's going up, and it's outpacing inflation here. Home prices are going up faster than that, and they always have in the Bay Area. It's becoming increasingly challenging to recruit management and key technical positions into Marin. People don't want to move, which puts them in a tough commuting situation that is hard to maintain. MH: In your opinion, what impact is healthcare consolidation having on the overall industry? Domanico: I think, over time, it has taken the local community flavor out of healthcare. The natural progression in most of the health systems is their local boards, and then it's really hard to manage 25 or 30 local boards, so they consolidate into regional boards and then a national board. I think it just naturally moves the connection to the system away from the community.